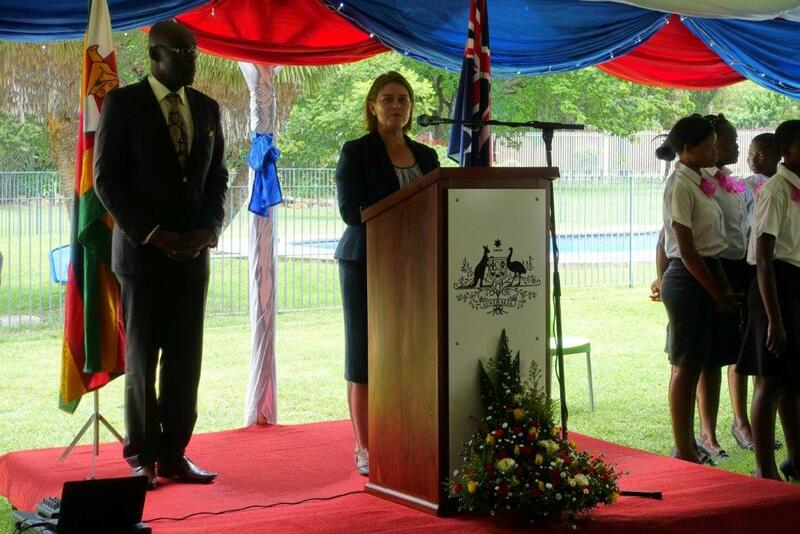 It is a great honour to host this event today, to celebrate Australia, to celebrate our relationship with Zimbabwe and also, on behalf of myself and Christina Landsberg, departing Head of Development Cooperation, to say farewell. We arrived more or less together in early 2015 and I know I speak for both us when I say that our lives will be forever touched by the friendships and connections we have made, the incredible experiences we have had. On Thursday 27 July 2017, Australian Ambassador Suzanne McCourt hosted a reception for Australian Alumni from eight African countries who were attending an Alumni Leader Workshop in Harare on 27 and 28 July 2017. To get in touch with Australian Alumni Associations from Zimbabwe, Zambia and Malawi, contact Rufaro Shumba. On Friday 14 July, Her Excellency Ambassador Suzanne McCourt visited the Dombwe Piped Water Scheme in Chegutu District. The Scheme benefitted from the rehabilitation of critical infrastructure that had rendered the scheme non-functional since 2000. Australia, through partner Welthungerhilfe (WHH), supported drilling and provision of pumps, pipework, water tanks and water meters. The project assisted Local Authorities to improve systems such as billing, GIS planning, financial management and customer relations, and trained community change agents to promote hygiene and sanitation. On 20 June, Embassy staff Rose Kapungu and Christina Landsberg travelled to Mutoko in Mashonaland East Province of Zimbabwe to visit Australian-supported projects by the Community Technology Development Organisation (CTDO). The organisation works in partnership with Australian partner, Action for Poverty (AFAP), and is supported by the Australian Government through the Australian NGO Cooperation Program (ANCP). The visit showcased the success of the organisation’s 3-in-1 model of community development. This integrated model provides support in the form of food security, health services and water, sanitation and hygiene. Friday 3 March was a big day for science in Africa as the first ever Africa Science Buskers Festival took off at the Australian Embassy in Harare. Jointly organised by the Embassy and the Zimbabwe Science Fair and funded through the Direct Aid Program, the festival promoted science education with schools from all over Zimbabwe, and also with school from Zambia and South Africa 'busking' for first prize with their best scientific presentations. Out of 213 entries, 20 finalist teams from both junior and senior schools competed in this competition. The projects and designs from Africa's innovators of the future included amongst others nanofertilizer, self-cleaning car paint, a hydraulic gate opening system and an innovative solar water pump. Ambassador McCourt took the opportunity to celebrate women in science with many projects, including the senior school winner Carol van Rooyen, coming from young women. BULAWAYO – Beneficiaries of Zimbabwe Development Democracy Trust (ZDDT)’s nutritional gardens, in four different wards across the city, say the project has significantly improved the diet for their families. ZDDT, in partnership with Sally Foundation of Australia, started the nutritional garden projects for communities in Wards 15, 19, 21 and 27 following the economic crisis between of 2008. The gardens, which now have an increasing variety of crops of fruit and vegetables, continue to benefit residents who have also learnt how to prepare exciting and attractive meals for their own tables. The International post graduate paediatric certificate (IPPC) and international postgraduate paediatric nurse certificate (IPPNC) has just celebrated its third graduation at the Australian embassy in Harare hosted by Ambassador Suzanne McCourt. Also attending were Professor Kathryn Currow and Dr Phillip Britton from The Westmead Children’s Hospital, University of Sydney which partly funds the program. The Australian IPPC program in Zimbabwe initially received Australian Government funding in 2014, through UNICEF. On 8 December 2016, the Australian Embassy in Harare was joined by partners from several non-governmental organisations (NGOs) and disabled people’s organisations (DPOs) to commemorate the International Day of Persons with Disabilities (IDPwD). The day is observed annually on 3 December and aims to promote an understanding of disability issues and mobilise support for the rights, dignity and well-being of persons with disabilities (PwD). This year’s theme for IDPwD – ‘Achieving 17 Goals for the Future We Want’ draws attention to the 17 Sustainable Development Goals and how these goals can create more inclusive and equitable communities for persons with disabilities. Over 160 women and men converged at the Australian Embassy on 25 November to mark the International Day for the Elimination of Violence against Women (IDEVAW), celebrated under this year’s theme, “From Peace in the Home to Peace in the World: Make Education Safe for All”. The event was organised by the Embassies of Australia, Canada, Denmark, the Netherlands, United Kingdom, United States of America, and three UN agencies: UN Women, UNICEF, UNFPA. Australian Ambassador to Zimbabwe H.E. Suzanne McCourt welcomed guests, and highlighted in her speech the significance of ending Violence against Women (VAW) – a grave human rights violation. Thirty three successful Australia Awards Awardees from Zambia and Malawi gathered in Lusaka for a pre departure briefing from 25 to 26 October 2016. Representatives from the Governments of Malawi and Zambia were also present. Pre departure briefings are designed to prepare the participants for life and study in Australia. Australian High Commissioner to Malawi and Zambia, H.E. Suzanne McCourt applauded the awardees and urged them to make the most of this opportunity through travel, networking and establishing people to people and ongoing links with Australia. Workshop Facilitator, Fredy Panganayi delivered an interactive training on successful strategic management of projects in alumni’s different spheres of influence. H.E. Suzanne McCourt was present at the workshop and commended the Association for continuing professional development initiatives that develop, equip and connect Alumni. The Zimbabwe Australia Alumni Association (ZAAA) in collaboration with the Australian Embassy organised an Industry Insights workshop for Zimbabwean alumni who studied in Australia. The workshop was held on 30 September in Harare and attended by over 30 members. This was the first capacity building workshop for Zimbabwean Alumni from Australia. Next week Perth in Western Australia is hosting the first Australia-Africa Week, to start on 5 September 2016. At least twelve mining ministers from Africa, including Deputy Minister for Mines and Mining Development, Hon. Fred Moyo, are taking part in the events throughout the week. They will be joined by a substantial group of representatives of Australia’s mining and extractive industry: company executives; investors; financiers; suppliers; and mining service providers. The Australian Embassy shares the concerns of many Zimbabweans at the violence which has occurred over recent weeks in Zimbabwe. The use of violence is not acceptable under any circumstance. The Australian Embassy wishes to emphasise that the rule of law, respect for human rights, right to free speech, freedom of assembly and other democratic freedoms are at the heart of the Zimbabwean Constitution and must be respected by all parties. We encourage the Government of Zimbabwe to ensure the democratic freedoms of all Zimbabweans are fully protected. For more information, please contact Ambassador Suzanne McCourt or the Australian Embassy (details below). The article derives from an interview between Nixon Nembaware, The Gender Equality and Social Inclusion (GESI) Officer for the SELF project and Diana Tsuro, the Social Services Officer for Zvimba Rural District council. The SELF project (Sustainable Services for Everyone beyond the Lifetime of the project at Fair price) is a CS WASH Fund project that aims to enable 10 Local Authorities to provide sustainable safe water supply and sanitation services, and promote good hygiene practices among the citizens in their areas of jurisdiction. The SELF project was initiated by Welthungerhilfe Zimbabwe, through Australian Aid funding, to support urban councils across Zimbabwe with training, technical personnel and grants for water and sanitation hardware rehabilitation. Gwanda Town is the Provincial capital of Matabeleland South province, situated about 126 km south of Bulawayo, the country’s second largest city. In the last decade the town has seen a lot of population growth and increased demand for Water, Sanitation and Hygiene (WASH) service delivery. World Vision Zimbabwe working in conjunction with the Municipality of Gwanda (MoG) is implementing an Australian Aid Funded WASH project, funds managed by UNICEF. The project has supported and promoted the Participatory Health and Hygiene Education activities that have led to the establishment of school and community health clubs. The clubs now serve as a source of information and inspiration in strengthening and improving hygiene practices. The Malawi Australia Alumni Association (MAAA) in collaboration with the Australian High Commission organised a leadership and resource mobilisation workshop for Malawian alumni who studied in Australia. The workshop was held on 17 June in Lilongwe and attended by over 25 members. It was facilitated by prominent Australian public health specialist Dr Rob Moodie, who is currently Professor of Public Health at the College of Medicine, University of Malawi, and MAAA member, and Head of Quality Management, Ministry of Health, Dr Andrew Likaka. Better service provision for less! City of Kings rolls out pilot project with community trucks for waste collection: clean streets don’t have to cost the Council a lot of money. With a clever and innovative idea the city of Bulawayo looks much tidier than one year ago. What sounds like a dream, the City of Bulawayo has made come true: cleaner streets and properties without increasing the number of staff and vehicles to collect refuse. “We always try to find innovative ways of improving the service delivery to the residents”, says Nesisa E Mpofu, the Council’s spokesperson. From 9 to 11 June the Australian Embassy hosted the Black Screen Australian Indigenous Film Festival in Zimbabwe, showcasing the best of Australian Aboriginal and Torres Strait film-making and storytelling. The films were screened free of charge at the Alliance Française in Harare. On 9 June Australian Ambassador, Suzanne McCourt, launched the festival with the premiere screening of the film ‘Mabo’, a moving story of one man’s fight to claim his heritage. During her opening remarks, the Australian Ambassador said ‘this festival provides a unique opportunity for Zimbabweans to experience Australia’s rich and diverse Indigenous culture and history. The films are all entertaining, and all very different, but each, in its own way, is moving and though-provoking’. Approximately 64 school girls from four local high schools (Harare High School, Hillbright Science College, Mufakose High School and ZRP High School) attended a forum hosted by the Australian Ambassador on Friday 27 May. The aim was to inspire the young girls by giving them an opportunity to interact with successful, working women who manage to juggle their careers along with their social and familial duties. A two-day regional leadership workshop for Australia Awards alumni was held in Lusaka, Zambia on 25-26 February. The workshop brought together 31 African alumni in leadership positions to discuss ways in which they could effectively fulfil their roles and consequently drive sustainable change in their organisations and countries. On 15 February 2016, H.E. Suzanne McCourt hosted a reception in Lusaka for former Australian Prime Minister and Ducere Business School Chancellor, Ms Julia Gillard. Ms Gillard’s visit to Lusaka coincided with a leadership workshop organised by the Australian High Commission and the Zambia Australia Alumni Association (ZAAA), which provided Zambian alumni with the opportunity to hear Ms Gillard’s views on both leadership and education. Science Circus Africa’s Zimbabwe tour running from 11-22 March, has reached over 5000 students and teachers from over 100 schools in Harare and Manicaland provinces. Dr Graham Walker, founder of the Science Circus, completed the Zimbabwe leg following successful tours in South Africa, Botswana, Mauritius, Malawi, Zambia, and soon Namibia, which have reached over 65,000 people in southern Africa, with support from the Australian Government, through the Direct Aid Programs of the Australian Embassy in Harare and the High Commission in Pretoria. The project was founded by Dr Walker in 2013, with the Australian National University and Questacon – The National Science and Technology Centre (Australia). Over 250 women and men from different walks of life came together for a 5km “Power Walk” to mark International Women’s Day – symbolic of this year’s theme, “Planet 50-50 by 2030: Step It Up for Gender Equality”, organised by the Embassies of Australia and Sweden, the Danish Embassy Office, the EU Delegation in Zimbabwe and UN Women. DFAT provides core funding to World Food Program each year. Out of its 2015-2016 allocation for Africa WFP will spend approximately 11% ($3,142,943 ) in the DRC; 12% ($3,591,935 ) in Malawi; and 11% ($3,292,607) in Zimbabwe. The funding will support food distributions and cash transfers to vulnerable and food-insecure populations, including in response to the el Nino induced drought. The El Nino weather phenomenon, one of the worst in 50 years, has caused intense drought in southern Africa that will have a "devastating" impact on the region's food security. On the 10th of February 2016, Government of Zimbabwe announced an official “2016/17 Drought Disaster Domestic and International Appeal for Assistance” to mitigate impacts of the drought. Zimbabwe Vulnerability Assessment (January 2016) noted likely impacts on the crop and livestock condition, domestic and production water situation as well as on health and nutrition outcomes. DFAT’s core funding to WFP is expected to address some of these impacts. In Malawi Australia’s contribution to WFP will provide relief assistance and contribute to restoring food security, rebuilding sustainable livelihoods and strengthening the resilience of the most vulnerable food insecure population. With the funding, emergency food assistance will be distributed to food-insecure people, while linking them to longer-term social support and resilience-building activities. In DRC WFP aims to assist 1.6 million people in 2016 by providing life-saving food assistance and cash for internally displaced people, refugees and vulnerable host communities in conflict-affected areas in Eastern DRC. Displaced people returning to their areas of origin will receive assistance such as school feeding, which contributes to increasing school attendance and restoring a sense of normality. WFP also intends to support smallholder farmers’ access to local markets and education by improving infrastructure. One year ago today, human rights activist and leader of Occupy Africa Unity Square movement, Itai Dzamara was abducted, and his whereabouts remain unknown. The Australian Embassy remains deeply concerned about the abduction of Mr Dzamara, and disappointed by the lack of progress in this case. Zimbabwe’s constitution guarantees fundamental rights to all its citizens, including the right to life, personal liberty, freedom from torture, freedom of assembly and association, and freedom to demonstrate and petition. Peace and prosperity cannot exist where fundamental rights and freedoms are not upheld. For human rights to be respected and the rule of law to prevail, impunity for perpetrators of rights violations must not go unchallenged. We once again call on the Government of Zimbabwe to accord Mr Dzamara the full protection of the law; do everything in its power to determine his whereabouts; and continue to report on the progress of its investigation. We urge the Government of Zimbabwe to do all it can to bring those responsible for his abduction to justice. For more information, please contact Ambassador Suzanne McCourt. BOSTON, MA – The Disability Rights Fund (DRF) – a grantmaking collaborative between donors and the global disability community which supports the human rights of persons with disabilities – today announced its first 2016 grants round, “CRPD at 10: Accessing the Right to Development.” Grantmaking in this round will be targeted to disabled persons’ organizations (DPOs) in Ghana, Haiti, Indonesia, Malawi, and Myanmar. The deadline for applications is March 14, 2016. The broad objective of the Fund is to empower DPOs in the developing world to use the United Nations Convention on the Rights of Persons with Disabilities (CPRD) to increase participation of persons with disabilities in society. On 2 February the Australian Ambassador to Zimbabwe, H.E. Suzanne McCourt, in association with the Zimbabwe Australia Alumni Association (ZAAA) hosted a farewell drinks event for Zimbabwean students about to embark on further study in Australia. The students will be undertaking undergraduate and post-graduate study in a variety of fields including commerce, management and public health to name a few. The event brought together over a hundred guests including students, their parents, Australian alumni, Australian university representatives and The Zimbabwe Australia Business Council representatives. For many students it will be their first time in Australia and the event was aimed at creating a peer network they can draw on when they’re in Australia. Thank you all for being here to celebrate Australia Day. Every year on 26 January, Australians at home and abroad celebrate this day, not so much as to mark the arrival of the First Fleet into Botany Bay in 1788, but to celebrate the highly developed and multicultural nation we have become. In doing so we particularly recall the special place of Australia’s indigenous people. It has become our tradition every time we have a major public meeting in Australia to acknowledge the indigenous inhabitants on whose lands we meet, and pay respect to them and their ancestors. On 26 August 2015, Ambassador Suzanne McCourt and Second Secretary Avigail Shai officially opened the refurbished mother’s room in the children’s ward of Harare Hospital, one of the largest hospitals in Zimbabwe. The refurbishment of the mother’s room and ablution facilities for parents was part of a successful Direct Aid Program project. The project also provided for the purchase of bed-chairs. Before, mothers were not allowed to stay with their sick children overnight because of the lack of facilities. Now mothers have a bed to sleep next to their children, working ablution facilities and a mother’s room to allow them to cook and rest. On 6 August, the Zimbabwe Australia Alumni Association (ZAAA) hosted a cocktail reception at the Australian Embassy for Zimbabwean alumni of Australian universities. The event brought together over 50 alumni from government, the private sector and civil society and gave them an opportunity to reunite, network, socialize and learn more about the Alumni Association’s plans for the future. Dr Gary Hunter from Australia recently spent three months in Zimbabwe assisting medium-sized local authorities to implement Geographic information Systems (GIS). Following his successful six-month deployment with the City of Bulawayo in 2014 on behalf of Australian Aid and GIZ, in 2015 he was supported by GIZ to return to Zimbabwe to work with the local authorities in the towns of Gweru, Kadoma, Chinhoyi and Kariba. Today marks 4 months since the forced disappearance of human rights activist and leader of Occupy Africa Unity Square movement, Itai Dzamara. The Australian Embassy remains deeply concerned about the abduction of Mr Dzamara. We reiterate our calls on the Government of Zimbabwe to do all it can to determine Mr Dzamara’s whereabouts, provide regular, comprehensive reports to his family and the public on the progress of its investigation, and bring those responsible for his disappearance to justice. Your Excellency, it gives me great honour to present to you the letters of credential from the Australian Governor-General, appointing me as Australia’s High Commissioner to Zambia. I am also honoured to present to you the Governor-General’s letter of recall for the former High Commissioner. The Government and people of Australia continue to greatly value our long-standing relationship with Zambia, which has been built on our shared democratic traditions and common history as members of the Commonwealth.